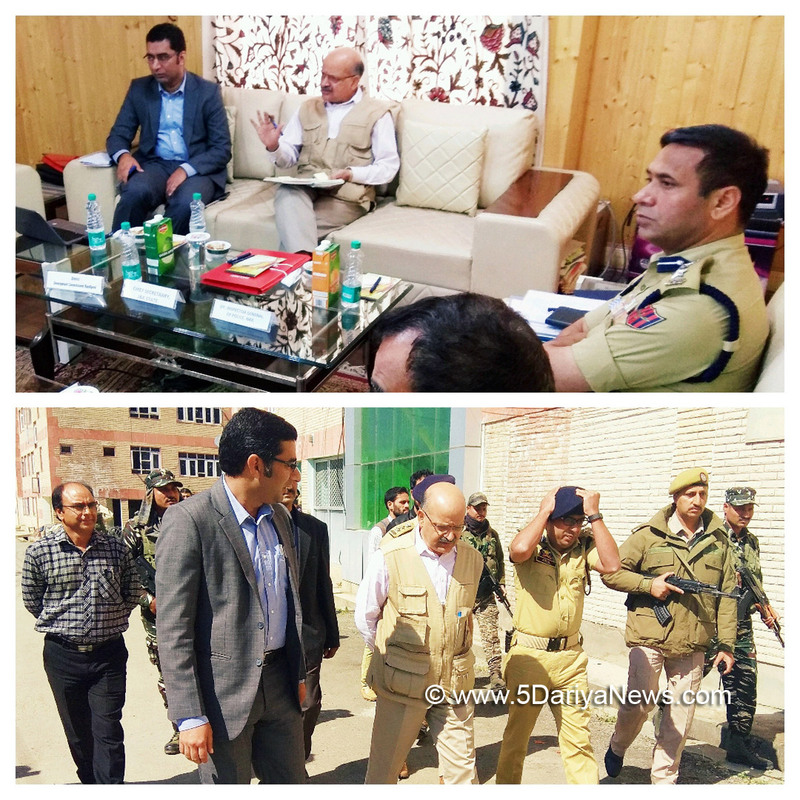 Chief Secretary, BVR Subrahmanyamtoday visited Kupwara and undertook a detailed review of the preparedness for smooth, free and fair conduct of Urban Local Body and Panchayat Elections.The Chief Secretary also took a comprehensive review of developmental works being executed by various agencies in the frontier district at a meeting with the district officers.The meeting was attended by DIG North Kashmir, Dy Commissioner Kupwara, SSP Kupwara and Handwara, ADDC Kupwara, ADC Handwara, ASP Kupwara, Commanding Officer 98 Bn. CRPF, 162 Bn CRPF, SDM Lolab/Karnah, ROs Handwara and Kupwara, Nodal Officers, Zonal and Sectoral Magistrates and other concerned officers.DDC Kupwara, Khalid Jahangir informed the Chief Secretary about the arrangements put in place for ensuing local body polls including details of EROs, number of electors in three Municipalities of Kupwara, Handwara and Langate, number of migrant voters, number of polling stations, RO and AROs in each municipality, deployment of polling staff, deployment of magistrates, appointment of micro-observers, liaison officers, schedule of elections, availability of election related material including randomization of EVMs, distribution of election material, webcasting of polling stations and implementation of Model Code of Conduct. Chief Secretary instructed the DEO that all measures should be taken to ensure that MCC is adhered to in letter and spirit, Observers allowed to work without any interference and all plans should be worked out meticulously to avoid any inconvenience to both contestants and voters.The Returning Officers informed the CS that a total of 51 candidates are contesting the ULB polls including 29 from Kupwara, 18 from Handwara and four from Langate Municipality.The DEO apprised the CS that familiarization drills have been properly conducted, Dispatch Centers set up, Strong Room and Counting Centre for all the three Municipalities established, Election Control Room and Help Desk towards redressal of grievances and queries set up, transport plan framed and vehicles identified and remuneration of polling staff already disbursed.The meeting discussed security arrangements made for the smooth conduct of the polls and need of a safe environment for the elections.Chief Secretary urged all officers and stakeholders to understand the need for providing enabling environment to the people to participate in the elections, ensure conducive environment and function as facilitators for strengthening grass-roots democratic institutions. Later, Chief Secretary took a comprehensive review of various developmental works going on in the district. He directed the district administration to ensure completion of languishingprojects on priority. He impressed upon the PWD to mobilise men and machinery on war footing towards completion of 17 bridges languishing since decades and seek sanction of remaining projects within next 10 days. He also instructed PWD to take up macadamisation of roads pending as early as possible keeping in mind the climatic conditions.District Development Commissioner projected the need to diversify tourism potential of Kupwara, a scenically rich district, by opening up areas hitherto unexplored besides promoting leisure, border and adventure tourism by developing Teetwal and Keran as tourist spots.Chief Secretary also reviewed the progress under various Central and State Sponsored Schemes like PMAY, Saubhagya, Ujjala and Ujwala. ACD Kupwara informed the CS that under PMAY, 1620 beneficiaries have been identified as per SECC and cases have been sanctioned in favor of 1579 beneficiaries.The Chief Secretary expressed satisfaction over the progress achieved under these schemes and emphasized the need to work with added zeal for sustained benefits to the people of the district.DDC raised the demand for augmentation of grid capacity, one additional grid station for Kupwara wherever technically feasible, upgradation of three receiving stations at Trehgam, Villgam and Chogaltoto cater to the needs of the people during the months of winter.Chief Secretary assured all possible assistance in this regard.Meanwhile, Chief Secretary instructed DDC to deploy a team of expertsfor selection of alignment over Drass-Gurez-Razdan Pass-Machil-Keran Corridor on priority basis.